I never know what to make as side dishes for steak when we have it. Mashed potatoes can be a lot of work. I like something easy, so the past few times we had steak, I’ve made smashed potatoes. Another favorite side dish with steaks is grilled zucchini and squash. Oh, I just love the flavor the grill gives the squash. I sent those out with my husband to grill. Then, I got to work making these smashed potatoes. They are far less work than whipped potatoes or mashed potatoes. This past weekend our middle child was turning 12, and he loves steak. I picked up a cake and some ribeyes at Sam’s while he was still visiting his dad. I thought he’d like the surprise when he got home for dinner. My poor husband froze his rear off grilling us steaks in 40-degree weather. While I was nice and toasty inside making the smashed potatoes, I grabbed the camera to document the process. Our youngest never eats much on steak night, but she does love potatoes. 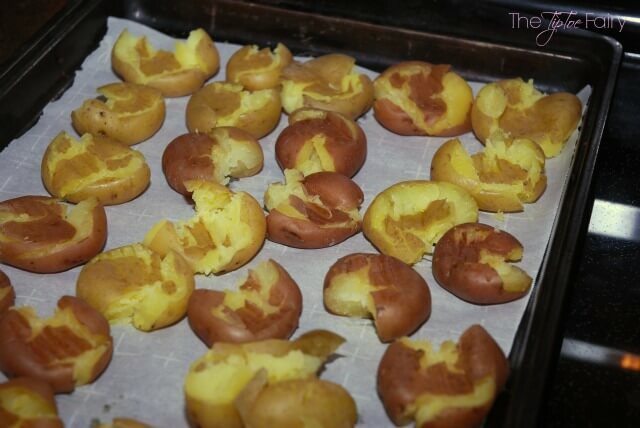 I had this giant bag of mini red and gold potatoes for roasting. These are just cute little bite-sized potatoes. They were perfect for smashed potatoes. Since we are all huge garlic fans, I went with a garlic butter sauce along with a fresh grinder of additional garlic and herbs, and I finished it off with sea salt for flavor. The garlic and herb grinder I used is actually for bread dipping. You grind it up and put it on a saucer with some olive oil. 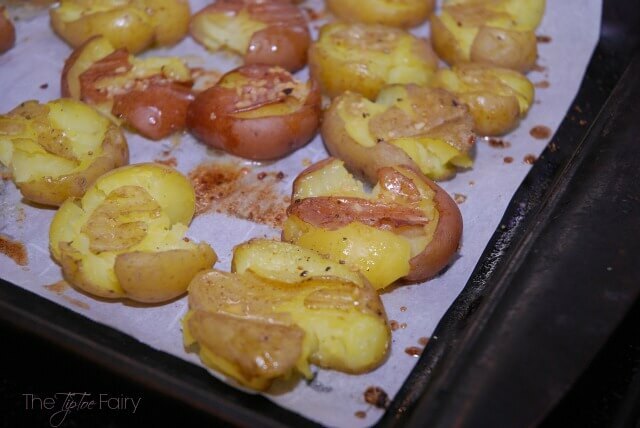 It’s really delicious for bread dipping, but I thought it would be great for topping the smashed potatoes, too. They came out just perfection. A little crispy on the outside and fluffy on the inside and the buttery garlic and herb flavor made them just scrumptious. Remove from water and place on a baking sheet. 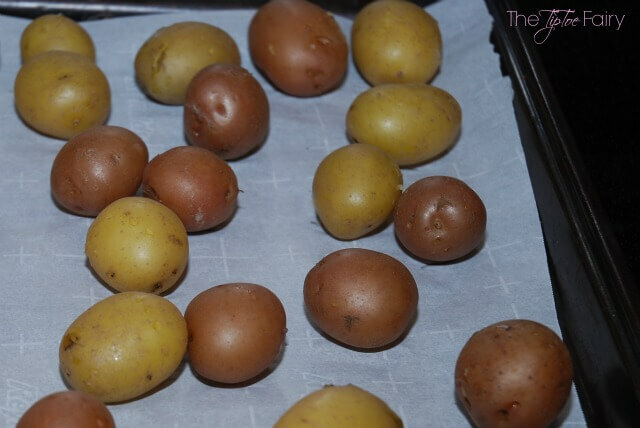 Using a fork or potato masher, gently mash each potato. Make sure not to mash too hard or it will break up the potato. You want it to be one whole piece. Drizzle the garlic butter over the potatoes. Then using the grinder, freshly grind the garlic and herbs over the potatoes. And that’s really all there is to it! These go great with steak, roast, pork chops. My kids even ask for them as a meal alone. What’s your favorite potato recipe? As a good Irish girl, I have never met a potato that I didn’t like. I will definitely have to try out this recipe. OH man, those are awesome. I think my whole family would love these. I love potatoes anyway you can give them to me! This one would be great for the Super bowl (if I don’t eat them all myself after I make them). Oh so delicious and great for a party! Potatoes, garlic, cheese and herbs are the best combination ever invented by man! I am pinning these and I will definitely make it for my family to enjoy! Those look so yummy! 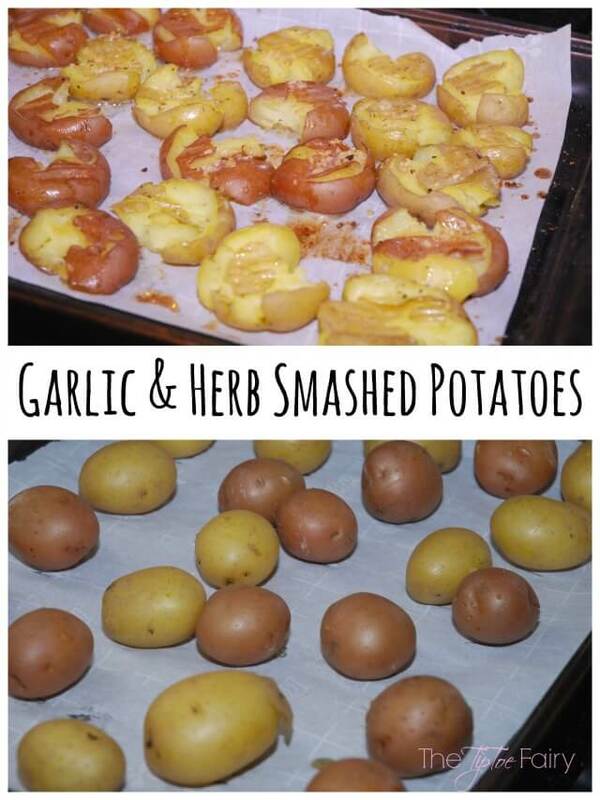 I love potatoes because they are so versatile! And they absorb flavor well. These look so yummy! I love garlic and potatoes. I am going to have to give these a try. 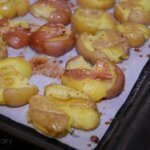 My kids love the smash potato, I’m sure they would also love your style of your smash potato. My oh my, that looks marvelous! My family is a huge fan of potatoes. 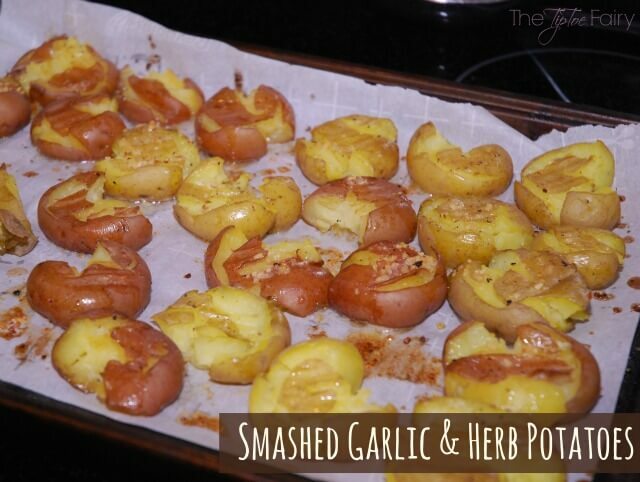 I am sure we’re going to love the smashed garlic herb potatoes. Oh yummy! What a great way to make one of my favorite vegetables. I love a good potato recipe. Thank you for sharing this! Oh we love potatoes. 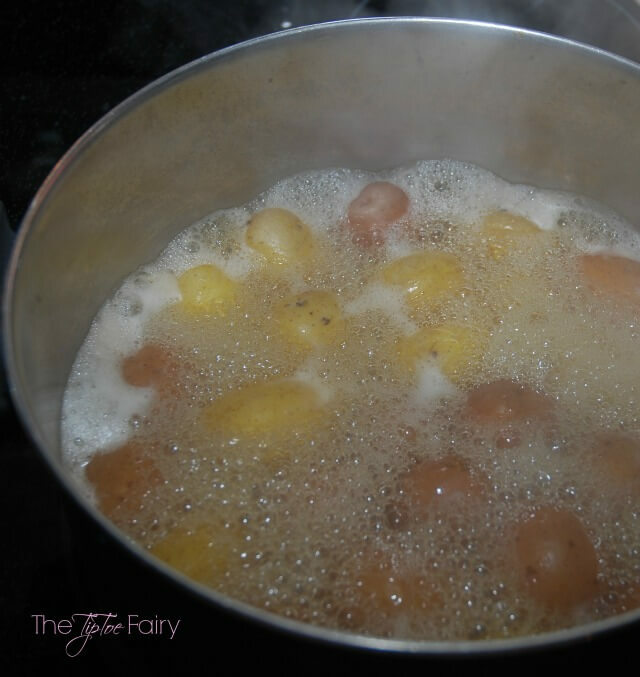 Garlic is such a good ingredient to use and we always have it on hand. Wow, this is just too easy!